How NeoFinder catalogs your photos! 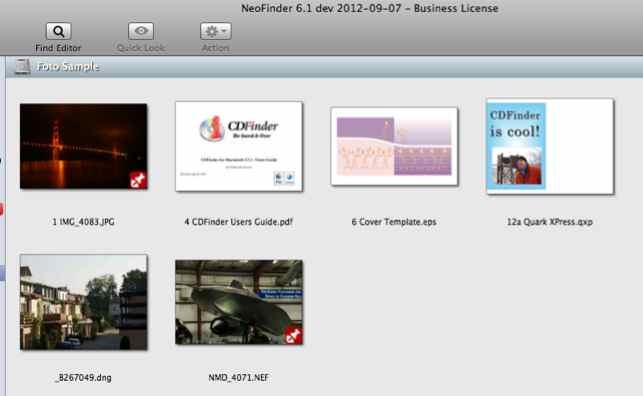 NeoFinder can create thumbnails of photo and image files when a volume is cataloged. To turn this feature on, simply use the checkbox in the NeoFinder Preferences or the catalog settings, and select the size of the thumbnails you want. You can also specify the size of the preview that NeoFinder generates. NeoFinder will use any existing thumbnail that the photo already contains, if it is larger than this value, greatly improving cataloging speed, but eventually reducing the quality of the thumbnail. The size of the preview of course also influences the resulting catalog size. Since NeoFinder contains enhanced algorithms that allow very quick access to any such data, the Find and general display speed are not much affected by that size. .nef, .raf, .orf, .dng, .mrw, .crw, .cr2, .kdc, .dcr, .ptx, .pef, .arw, .srf, .raw, .mos, .sr2, .erf, .nrw, .rw2, .3fr, .mef, .iiq, .rwl, and even the .fff files of the Hasselblad family of cameras. Since NeoFinder uses functionality of the core Mac OS X, it is always a good idea to update to the latest version of Mac OS X, and also make sure to install the frequent "Digital Camera RAW Compatibility Updates" from Apple. For some of these file types, you need to have the original application installed on the Mac you use to catalog the data. That is currently true for Luminar 2018, Aurora HDR 2018, and Cinema 4D files. If you find that NeoFinder can't create a preview for a certain file or file type, please contact NeoFinder Support, and we will try to work something out. Also, you may want to try to open that file in Apples Preview.app, as that uses mostly similar code as NeoFinder does to display photos, and check the results there. Of course, you can use that option in reverse to find item that have NO preview in the NeoFinder catalog. If you need to export or convert photos to a different format or size, look no further! No need for any external software any more, let NeoFinder do the job! 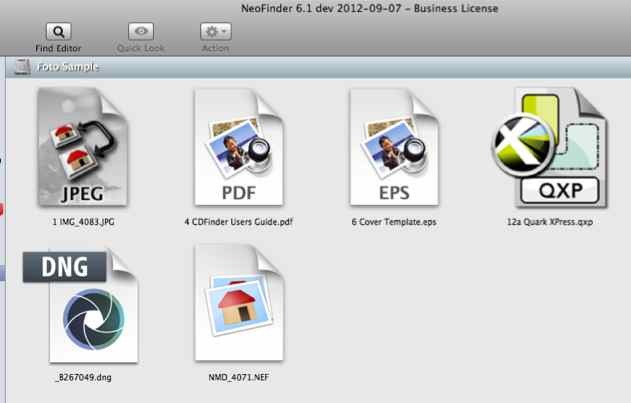 NeoFinder will then ask you for the location, format, and size for the exported files. 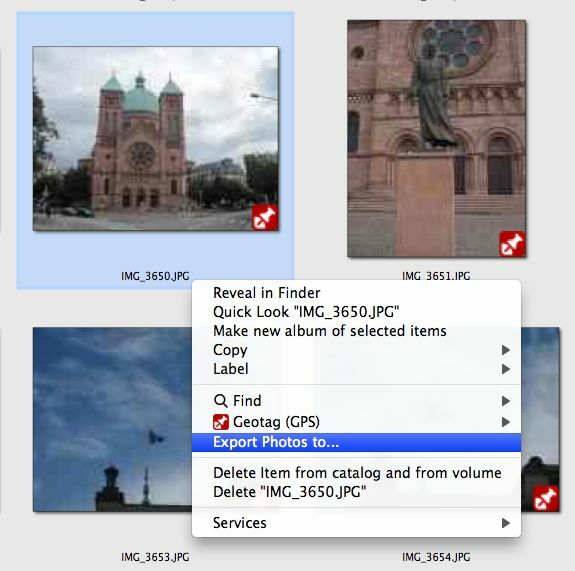 Additionally, you can ask NeoFinder to add all EXIF and IPTC metadata (including geotags) to the exported photo files. 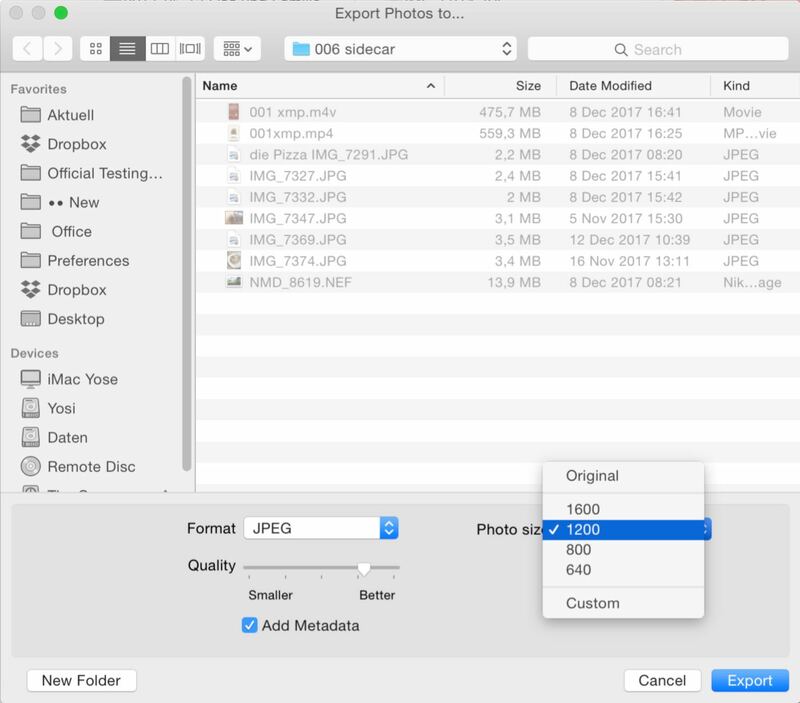 If the original volume of your photos is not online, NeoFinder will ask you to connect the device or insert the disk, to be able to read the original photo files. • NeoFinder will first try to use any existing embedded EXIF or XMP thumbnail in the photo. If you request a size that is larger than this, NeoFinder will read the entire photo and generate a new thumbnail in the requested size. Please note that this will increase cataloging time, of course, as generating a thumbnail fresh from the image requires the entire image to be loaded and processed. • When you change the pixel size, and update an existing catalog, NeoFinder will still use the older, smaller thumbnails from the old catalog during the update, to increase speed. So you need to create a new catalog to get thumbnails in a different size. Or update that catalog twice, one with no thumbnails, and then again with the size you require.